These last two weeks half a dozen circus artists and companies have been cloistered away from the outside world, visited only by a small group of lighting designers, scriptwriters, dramaturgs and others, as they work through a unique sequence of creative and practical assignments, mentoring sessions and production surgeries. The occasion is a laboratory in a church: the VOLT Circus LAB, a ten-day research intensive produced by Ausform in partnership with Circomedia and held at St Paul's, an old ecclesiastical space refitted for circus performance and creation. The pilot for a scheme the organisers hope to run over the next three years, the LAB is a reflection of a particular approach to artistic support, or a kind of ethos: practical, flexible, individualised, and committed to drawing artists and producers together in a close, responsive relationship. Lina B. Frank, Ausform's director and executive producer and the driving force behind the LAB, stresses this point most of all when talking about the scheme: each artist has their own project and their own path, no two alike, and so they receive support tailored to their particular needs. In some cases this will mean practical tasks – a workshop on writing marketing copy, or a production surgery on how to apply for funding. In others, it will mean the artists being challenged in their creative process – often with the input of outside mentors. 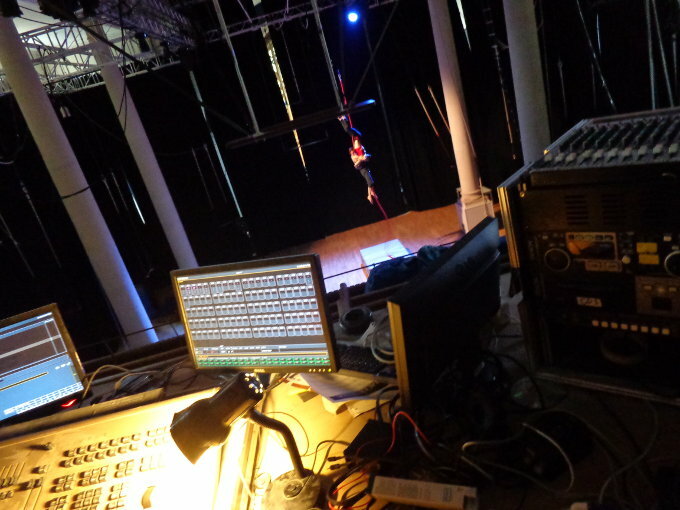 In all there are six circus artists/companies working in the LAB, supported by ten professionals from various artistic and production backgrounds. Willow Vidal-Hall and Grania Pickard have been working on The Glass Ceiling, a piece which looks at repetitive behavioural patterns as a way into speaking on gender inequality. The Two Flying Williams (Will Davis and William Wagtail) have been developing Reach, a performance reflecting the intricacies of a relationship through new doubles technique, and Bella Kinetica have been refining their show Life on Wheels, a performance on roller-skates and aerial apparatus set in the post-war era. Ziggy Slingsby has been working on her piece Horse, a performance for one rope artist and one bone-white horse skull that looks at the relationships, both theatrical and instinctual, between the human and the animal. Mike Bell & The Play People have been developing the clown piece The Unstable King, and, finally, the artist Truan Mathias has been looking at extending his comedy and contact juggling work into a longer show. For more on the project, and to read reflections written by the participants, check the LAB's blog. The LAB ran 4-8 and 11-15 August 2014; it was produced by Lina B. Frank for Ausform in partnership with Circomedia, and was funded by Bristol City Council and Arts Council England. The participating companies were Ziggy Slingsby, Will Davis and William Wagtail, Grounded Aerial, Bella Kinetica, Mike Bell & The Play People, and Truan Mathias, with support from Linn Broden, Ed Rapley, Adam Peck, Bim Mason, Silva Semerciyan, Tom Richmond, Anna Johnson, Rebecca Fitzgerald, Hannah Sullivan, and Lina B. Frank.